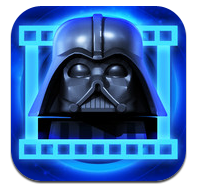 LEGO Star Wars Funzone is an app released on April 28, 2012 for the iPhone, iPod touch, and iPad. This is a description taken from LEGO.com. Please do not modify it. (visit this item's product page) Take LEGO® Star Wars™ Funzone with you everywhere and immerse yourself in the “Creations” photo gallery stream filled with awesome creations built and shared by fans in the community. You can also be the first to watch all the newest and coolest LEGO Star Wars videos directly on the app! VIDEOS Watch all the latest and coolest LEGO Star Wars movies, animated web comics and commercials. As a bonus feature, you can download each movie to the app, so you can watch movies when you don’t have access to a wireless network or 3G. CREATIONS Unleash the force of your creativity. Take pictures of your awesome new creations with the app and upload them directly to the Creations gallery where millions of fans can see and comment on them. Use the app to keep track of what other fans are saying about your creation. Look out for updates as the LEGO Star Wars team will be adding awesome new features and content. Facts about "LEGO Star Wars Funzone"
Take LEGO® Star Wars™ Funzone with you everywhere and immerse yourself in the “Creations” photo gallery stream filled with awesome creations built and shared by fans in the community. You can also be the first to watch all the newest and coolest LEGO Star Wars videos directly on the app! This page was last edited on 9 January 2016, at 21:42.